A $35 cup of coffee is still possible if you pay with a check. On Wednesday, Bank of America announced its plans to eliminate overdraft fees on debit-card purchases. This is of course, related to Regulation E changes. Bank of America customers will no longer pay $35 in fees to purchase a $3 cup of coffee if they use their debit card. Their transaction will be denied at point of sale if sufficient funds are not available. However, customers would be able to withdraw funds from an ATM and incur the fee. They will be notified and signal agreement to the charge at the ATM. Bank of America isn't the first to announce such a change, and it won't be the last. With Regulation E changes, financial institutions will see overdraft fee revenue decrease in an already tight earnings environment. How will credit unions be affected? Callahan & Associates recently completed a non-interest income survey of 150+ credit unions. Here are some of the preliminary figures around NSF/Overdraft/Courtesy Pay. Credit unions participating in our survey reported overdraft fees (NSF fees and Courtesy Pay) comprise 28.1% of total non-interest income (the sum of Fee Income and Other Operating Income). In 2009, credit union non-interest income totaled $11.6 billion; such fees, then, account approximately $3.26 billion in income for the industry. What will that revenue stream be a year from now? Moving forward, checks and recurring ACH payments will not require an opt-in for NSF fees. POS/Debit and ATM transactions will require the customer's consent. ACH transactions are in a gray area as the treatment may depend on where the transaction originates from. 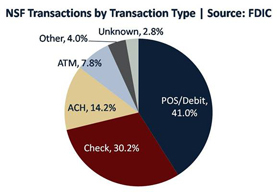 According to a 2008 FDIC study of more than 1,500 financial institutions, the group (assuming ACH transactions are evenly split) is approximately 55.9% of NSF transactions. So, of the $3.26 billion in NSF fees, $1.82 billion will be in flux and will be determined by how many members opt-in. I’ll assume the overdraft fee income from checks and recurring ACH payments will remain the same at $1.44 billion. The potential effect on credit union ROA will likely be around 10 basis points. A few caveats: ACH transactions represent $462.9 million in NSF fees. I've assumed (purely for ease) transactions are evenly split. The actual division will depend on the credit union's members' online habits and its online banking provider/data processor. Additionally, not all members need or use overdraft protection. If only 10% of members use the service, you only need those 10% to opt-in to maintain the same level of revenue. On average, the FDIC study found that 26% of customer accounts used the service. Great article and analysis. Now we just need to figure out alternative streams of NII.